So the Owls figured out that you could vote early and vote often, so now we are going to have a final vote and you can only vote once. We have this great news program idea, but Owl News is just so boring. So vote for the news name that you think is the best. So it has been a very long time since this blog has seen any new content, sorry about that. I have been working with a NC Battle of the Books club and there has not been a ton to add here. I hope that Guys Read will come out hiding soon, and we can get back to hijinks around reading. Until then you are welcome to read my 2017 NaNoWriMo story. I’m calling it Germantown, 1917 right now. I’m not super happy with the title, so that might change. I wanted a sort of Richard Peck kind of story and I hope that is how it reads. Remember this is a rough draft, I have not edited it at all and as of December 1, the story is not finished. I got to 50,000 words last night and went to bed. I will work on finishing the story in the next few days. Today is the second to last Guys Read meeting of the 2016-17 school year. We have two and half weeks left, but state testing steals our club time next week. So today we continued our rotation through RWLP, with some time writing. Rather than just have free writing today, we played a game of Roll-A-Story. This is the story I started, I’m not sure if the poison berries will be used by Lorenzo in a Socartes way or he will use them against his captures….Thoughts? It might have been a dark and stormy night, Lorenzo couldn’t tell. He had been trapped inside a hidden cave for generations. You see Lorenzo was a fire-breathing dragon and his abilities were valued highly by the Under the Hill people of the land of Daccd. In most worlds the Under the Hill People would be called Dwarves, but here in Daccd that term is considered rude and backward thinking. The Under the Hill People might have been a little rude and backward thinking themselves, but that didn’t stop them from being offended when you called them a dwarf. So Lorenzo the fire breathing dragon had be forced into labor when he was but a young hatchling. Hour after hour and day after day and year after year Lorenzo stoked the fires of the city of Arbb, the main city of the Under the Hill People. His belly fire heated their water supply, and gave the Under the Hill People warm meat and soup to eat. But Lorenzo wasn’t happy. He longed to stretch his leathery wings and push himself into the great open sky. He had read about the sky and the outside world in the books he was given by the kind librarian in the city. He also read about an ancient Greek thinker called Socrates, who gave up his life for his principals. Reading about Socrates gave Lorenzo an idea, if he could get a poisoned berry then maybe he could die for his principals and escape his prison? There once was a beautiful princess she was in a carriage riding to Bojangles Kingdom where she lived. Then her carriage was hit by a hamburger that was in the air Force for the Burger King Army they were fighting against the Arby’s tribe which were destroying villages in Burger King’s control. Bojangles Kingdom had the most toilets ever built and you know why. The princess was knocked out by the flying hamburger that crushed their carriage to pieces. Her vision was darker and darker then her eyes shut soon she ended up at a farm in a bed. She look around wondering where she was soon an old lady came in. “Good you’ve woken up” said the lady.” Where am I?” Said the princess. “A flying hamburger took your carriage out” said the lady. The soldiers were unconscious and so you were to. The soldiers are in another room there still unconscious” “What soldiers?Why am I wearing this dress?Why am I wearing a crown?” said the princess. “ Ok, You are suffering from memory loss.I have a soup for that”said the lady. Will she live, die or survive? We don’t so don’t ask us! Once upon a time, there was a knight. The most handsome knight to ever walk the land. With beautiful blond hair, bright blue eyes, and many muscles. But, he was also the dumbest person in the land. He slayed a hare, because he thought it was a dragon. He slayed the lord, thinking he was an evil mastermind who wanted to hang him for killing his pet. Then, he slayed the king, thinking he was also an evil mastermind who wanted to hang him. All this took place in the castle he was born in. His only friend, was his mother, because no matter how dumb he was, she loved him. Then, one frightful night, the knight heard a scream and saw blood on her mother’s bed. She wasn’t dead, oh no she was fine. The kidnapper however, had a knife in his arm. Then the castle talked. No, literally, it told him to go to the king’s bedroom and find the kidnapper in the bed. One day after that, a new king was given his crown by the pope. The castle told the knight to watch in the shadows, and see someone with a bloody arm. That would be him. A peasant did not return from the coronation. Later, he was found, decapitated, with a wine stain on his arm. The knight found that his mom was in the walls, telling him to kill innocent people. Then both were hung. The End! Ak40kevin556 was a knight of gta 5 his horse was a zentorno and his sword was an uzi. He started his day off like everyone else one magazine at a time one police chase before lunch. But something was missing then it happened he was informed that someone had placed a 9,000 dollar bounty on his head so the hunt began he went to his hidden cave of a house and grabbed 200 grand and spent it all on ammo. He starts with the body armor then the sticky bombs and then everyone’s favorite grenades. He stockpiles until he sees on his mini map a character who was definitely coming after him he runs out of ammunition and gets into his zentorno and takes off within seconds everything around him is blurry 3rd gear 4th gear then the epic montage ended and he hit another car and lost all his cred. He starts driving and notices a buzzard flying so fast he soon couldn’t keep up and the buzzard whips around and fires its first missile the knight jumps out and watches his car get blown to smithereens. He then pulls out a homing launcher and with 3 missiles the buzzard was down but he then remembered about the guy who chased him in the car he sees a jeep pull up at a red light he decides to steal the car he pulls out a pistol and kindly asked the man for his car. The man offered no hesitation. The knight was driving when the man pulled up beside him and with his hand out the window the other player throws a sticky bomb the knight pulls out his uzi and hits the stickybomb killing both of them. EVERY TIME can he not catch a break he goes home after being blown up he goes to bed rests his head 5 minutes after being dead. All because he picked up an unlucky penny. And he all like bruh i’m lost in space and i’m in a freaking cave i mean how i mean people for some reason started kissing me in like 2009 and i don’t know why ow yeah a dumb disney movie and i mean like bruh the most rough year of my life yo then then there is save the frogs i don’t need to be saved i can save myself but now i’m in space and it’s great yeah first frog on the moon mars and the sun heck yeah now i’m on my own foreign planet!!!!!!!! Once there was a two headed monster that liked to eat people that lived at a farm. One time he ate a person that was carrying an unlucky penny. He ate the man and the penny got stuck in his tooth. When he went to the dentist they pulled the penny out. When he got the penny back he put it in his pocket. When he got back to his farm he noticed that some of his animals were gone. He went inside, It was pretty late and he had a tough day. When he woke up to get breakfast his food was gone and during all that he still had the penny. The next day he went to the city and got robbed and the penny was stolen and all the stuff came back to normal. arrows lighting the sky with their fiery trails. What is RWLP you ask, well we begin a new and final chapter in Pine Hollow Guys Read today as we come toward the end of the school year. Now don’t freak out Guys Read is not going away, but it will cease to be a Wednesday club next school year. Guys Read will find time to be a club after school next year. So today we read something. Pick something and read, quietly for 20 minutes. The only rule…you can’t browse, you need to pick something and stay with it. Build some stamina, 20 minutes isn’t that long. A few lads will be asked to share at the end of the Read day. Next week we write. That’s right we write. You can write anything, a note to a teacher or a mother!!! It is Mother’s day coming up guys. You can write a story, or a play or a screen play, or a video game treatment. You can write a review of a book, or a game, or a meal you recently had. The only rule, you have to write for 20 minutes. Build some stamina, 20 minutes isn’t that long. Then in two weeks we learn. With permission from Ms. Ziller down in the LLC we will get access to both the print resources, that is a fancy way of saying books, and the digital resources, that’s a fancy way of saying computers, to learn something. You will be given a graphic organizer and you fill it out with something you have learned. Do you want to know more about Olympic Marmots? Go learn about them! Have you ever wondered how to edit a YouTube video? Go learn about it! The only rule is that you have your graphic organizer filled out by the end of the club time. Finally in three weeks we play. I have been slowly building up my tabletop and card game supply and on the days marked play, we play. You will learn a game and have some fun playing tabletop style games with the guys. If everything goes to plan we might even have a Friday Game Afternoon and invite the whole school community. You wold become our tabletop ambassadors and help people get into the games. So with a four-week rotation we will get to Read three times, Write twice, Learn twice and Play twice. I think we can handle that, don’t you? 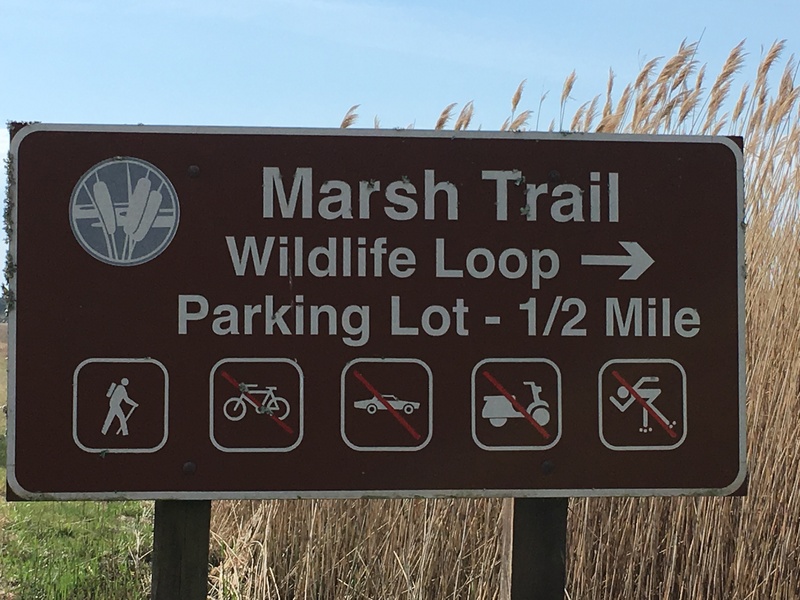 So aparently you cannot Egg Dance on the Marsh Trail. I guess you can’t ride bikes, scooters or drive 1970 cars either? >>>> But you can in my classroom! 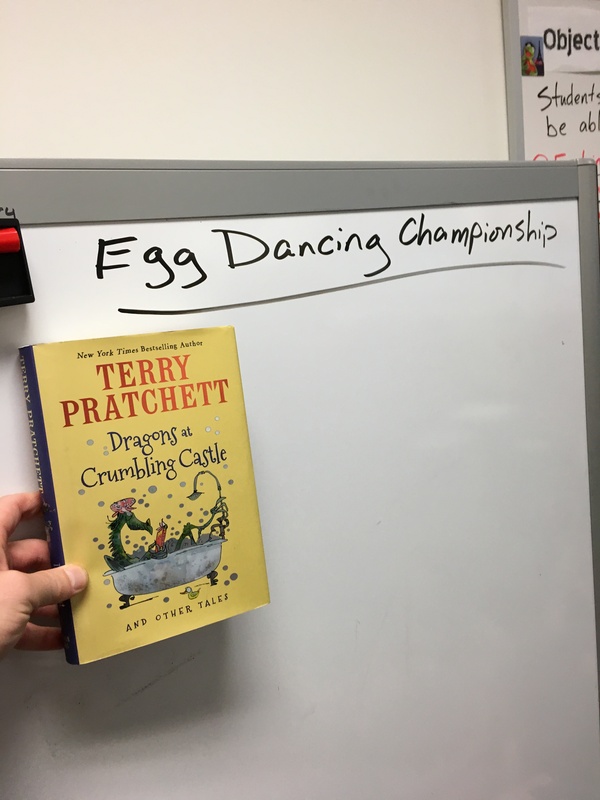 Today we ready The Great Egg-Dancing Championship by Terry Pratchett. I want the whole group to hear the great tale woven by Sir Terry so we can all appreciate our Pine Hollow Egg-Dancing Championship, which will be held soon after we track back in toward the end of April. Did you know Egg Dancing is a real thing? I have thought up a new plan for our Guys Read Egg Dance. Rather than real eggs, which could prove to be more mess than it would be worth, I want to use plastic easter eggs. what would we put in said eggs…Stay tuned! Do you know that warning? Have you ever been stabbed in the back by a friend? Have you ever marched your loyal army on your capital city? Do you have a salad named after you? Do you have any idea what I’m talking about? Why not do some history reading around this today? We complete our Egg Dancing Championship rules and regulations. We also need to finish reading the story. Write something about what you have been doing. If you have been playing Yukon Salon or Stack Jack do a review. Grab a computer and work together on a well written and interesting review dealing with how you play the game. Make sure you share your writting with Mr. Hutchinson (jhutchinson) so we can add it to the blog. Books and Basketball – pair the 64ish college basketball teams in the tournaments with a book you love. Set up a bracket and watch you books move throught he Sweet Sixteen, Elite Eight and maybe even the Final Four. We are very close to completing the rules for our Guys Read Egg Dancing Championship. Today we will finalize those as y’all keep finishing things. Remember I would love to add content to the blog, so as you finish things share them with me so I can upload them. If you need something new, go check out Books and Basketball, a game we created at SMS Guys Read to go along with the NCAA Basketball Tournament. You are welcome to get a group together and start a list of 64ish books so we can pair them with college basketball teams, to see how far they can go! Today in Guys Read I want you to….